We helped kick off the fourth annual First Bite Boulder promotion – a weeklong celebration of Boulder’s 40 best restaurants – with a lunch Saturday, Oct. 14, at Brasserie Ten Ten. Our seats at the bar offered a perfect combination of fun young people, Ten Ten regulars getting an early start on Saturday night and the purely lunch crowd (like us). The place was buzzing with energy, with two bartenders cranking out bloody marys and mimosas and a 15-minute wait for tables. We enjoyed our main dish – tomato bisque and trout with lentils. Service was snappy, and we shamelessly eavesdropped on the repartee between bartenders Meghan Lloyd and Atreus Gerbitz and among our young companions at the bar. Didn’t quite understand all that “about last night” talk. Also quite dazzling in the eye-candy department (along with Young Boulder) was the stunning flower arrangement greeting guests. The flowers are done by none other than Peggy Romano herself – she who owns Ten Ten, plus the equally popular Med across Walnut St., with husband Joe Romano. So let’s chalk up Brasserie Ten Ten on the short list of reasons to groove on Boulder. And, check out its $26.00 prix fixe menu “at many fine restaurants” during First Bite Boulder week. Jocularity. 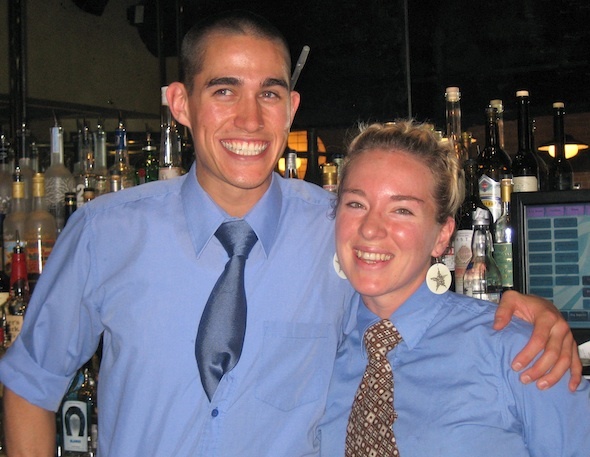 Holding forth behind the bar with poise, charm and bloody marys were a winning team of Atreus Gerbitz and Meghan Lloyd. Warm welcome. 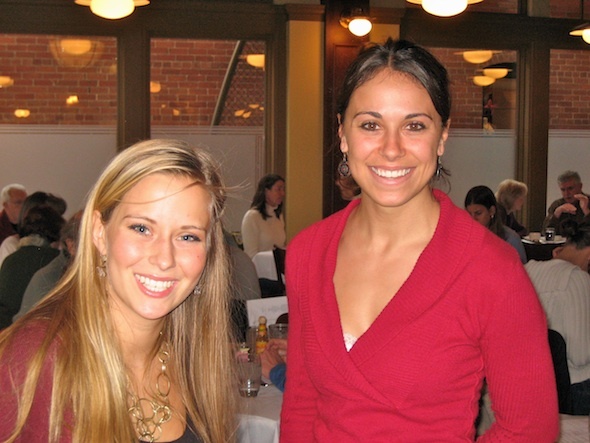 Greeting the Saturday crowd and getting them seated and happy were hostesses Lily Coleman (left) and Lauren Symmonds.